" /> Jeep Wrangler White Lake MI | Szott M-59 Chrysler Jeep " "
At Szott M-59 Chrysler Jeep we’re just as equipped as your new Wrangler to prepare you for your every thrill. Visit our showroom in White Lake, MI to explore our comprehensive lineup of new and pre-owned Jeep vehicles, or browse our selection online for a sneak peak. Conquer your every adventure in the all-new Jeep Wrangler. Regardless of the terrain –snow or mud, sand or rock, the Trail Rated badge of honor proves Wrangler’s Best-in-Class off-road performance. Enhancing your explorative capabilities, the Command-Trac 4×4 System splits torque 50/50 between the front and rear axles to provide traction to the tires that need it most, while the Rock-Trac 4WD system offers a 4 to 1 low gear ratio and crawl speed for even greater torque. With Best-in-Class highway fuel economy delivered by the 3.6L Pentastar V6 engine providing 17/21 city/hwy MPG, your new Jeep Wrangler allows you to roam futher than ever before by allowing you to explore up to 472 highways on just one tank of gas. 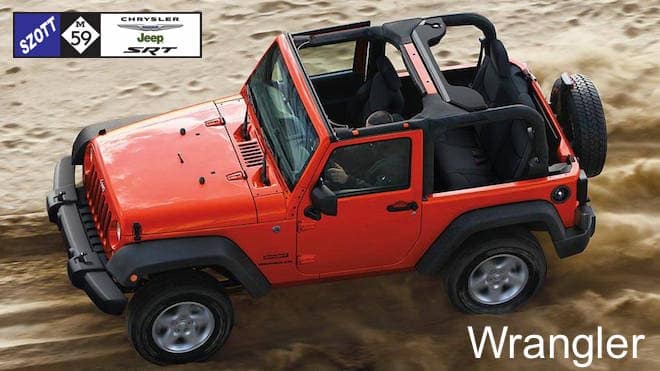 With an outstanding 285hp and 260lb-ft of torque, Wrangler promises no shortage of power when you need it most. Guarded like Fort Knox, Wrangler features 2.5mm stamped steel Skid Plates to serve as underbody armor protecting the fuel tank and transfer case, and is outfitted with a number of other rugged and durable accessories to keep you on the up and up. Heavy-duty, forged-steel dual front and single rear frame-mounted tow hooks, standard high-efficiency round fog lamps, and the wash-out interior with drain plugs make certain that your ready for anything that life throws at you, no matter how sticky the situation. Explore all the tech-savvy features Wrangler has to offer when you visit our Szott M-59 Chrysler Jeep showroom. Our expert Jeep specialists are excited to walk you through the Uconnect Voice Command, Navigation by Garmin, SiriusXM Travel Link and all the other exciting and convenient technology in your Wrangler. When we’ve found the model just for you, our dedicated finance team will work hard to secure the best loan for your budget. Spend some time at our user-friendly website to save some time at the showroom by checking out your pre-approved credit options and obtaining an instant trade-in offer online. Our product specialists are always on standby to answer any questions you may have, so feel free to call us at (888) 571-3764 or drop by during our convenient hours to meet with one our friendly Jeep enthusiasts in person today. Szott M59 Chrysler Jeep has the perfect new Jeep Wrangler for you. Find it here, along with White Lake’s best service and value. Get it all today. Buying a vehicle is a special experience. We understand that this isn’t something our customers do every day, which is why we treat every interaction with the respect that it deserves. Szott M59 has loyally served the White Lake market for decades because we believe that the community and its people supersede any expectations set by a corporation. This is your community. This is our community. When you are shopping for a new or used car like the Jeep Wrangler, you expect the experience to match the promise, which is why we are open and transparent every step of the way. Below, you will find more information about the new Wrangler. We hope that you’ll contact us and allow us the opportunity to show you why buying from the pros at Szott M59 Chrysler Jeep, is simply the best decision you can make. There’s more to a vehicle demonstration than picking out colors and taking a test drive. At Szott M59 Chrysler Jeep, we want you to know everything that’s important to YOU in your next new vehicle. The new Jeep Wrangler is uniquely positioned in the White Lake market to satisfy the needs of practical fun lovers everywhere—the Wrangler has the proper mixture of sporty handling and updated tech features that’s appealing to White Lake. Our team is here to make sure you’re aware of every feature, tip, and maintenance best practice because we take pride in delivering the ultimate shopping experience for our customers. Watch this video to get your engine revving for your new Wrangler, and then let the pros at Szott M59 take care of the rest.